We didn't quite squeeze in all of Europe last year, so we are continuing our tromp through Europe with Spain this fall. There is so much that we could cover and literally spends weeks upon weeks studying the country, but we're trying to stick to a two-week study of each country. 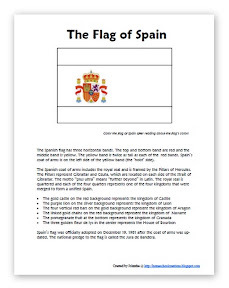 Here's a look at how we spent our first week of learning about Spain. such a fun adventure. Spain is a fun country and you could spend a year on it. Have fun. Super cool. Did you watch the Disney animated short about Ferdinand? We watched that last week, and it was so fun to see a simpler Disney. What song do you sing (the europe geography song you mentioned) and where can I find the lyrics/music? I've seen several people post about there "country" songs but never found out how/where they get them. any suggestions? Thank you so much for the great information, links, book lists, and printables! 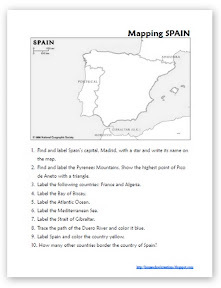 I would also like to know where you get your geography songs and to thank you for all your great ideas! It's so fun to see what you are doing while we are studying similar material. I was inspired by your blog to get started with the Galloping the Globe and we also got our Little Passports travel subscription started at the same time. About the songs: I found a great CD at the library to cover basic geographical themes like continents, habitats, ocean, maps, etc. It's called Teacher and the Rockbots: World. They also have a website: www.teacherandtherockbots.com. I am a nanny this summer am wanting to teach the girls I watch about different countries around the world. I am so thankful for your help and suggestions!